Welcome to Markplex tutorial 32 in this collection of tutorials to help you learn TradeStation EasyLanguage programming skills. EasyLanguage can be used to help you write programs to analyze forex, commodities or stock trading. This tutorial shows how it is possible to use Tradestation’s CloseD function to create a daily moving average that may be applied to an intraday chart. CloseD only allows you to look back, a maximum of 50 days, hence this program can only create, at most, a 50 days moving average. 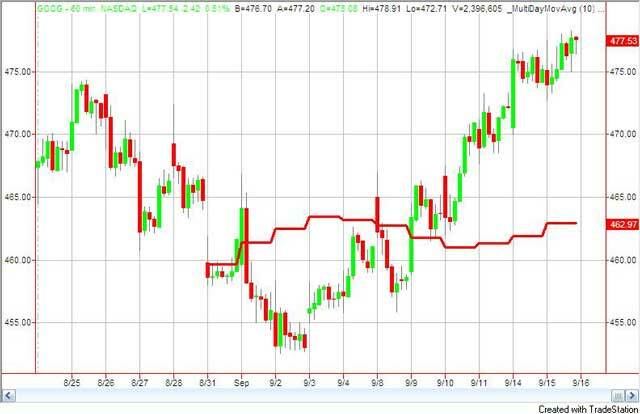 There are other ways to apply a daily moving average to an intraday chart – each has advantages and disadvantages. The following image shows a 10 day moving average applied to 60 minute Google chart. In this second part of the tutorial, I demonstrate another way of applying a daily moving average to an intrabar chart. If you see any errors in this tutorial – or I have not made something clear, I would be most grateful if you could please let me know. You can e-mail me at: tutorials@markplex.com. Also, let me know if you have any ideas for new tutorials.